Any discussion of Software these days needs to start with the admonitions that security should be _designed_ into systems, that it's not always feasible to _add_ security to a system without it, and that a system's first security breach may result in the failure of the system's owners' enterprise or organization. IT Professionals have developed a legacy of standards and recommendations for securing and operating information systems -- ignorance of them is no defence against blame or liability claims when a system is robbed of 'sensitive' data or it is otherwise lost or corrupted. Most security breaches are the fault of application software, not operating systems. For example: WordPress, the heart of more than 300,000 of the blogosphere's engines, has had a recent spate of vulnerabilities in the add-on applications available for WordPress which made inappropriate disclosure of personal information or allowed destruction or defacement of the stuff of blogs. Windoze and the *ixes (Linux & proprietary unix) all provide super-adequate capabilities for securing an application environment's OS, DBMS, EMail and Web servers. But much of a typical application environment's security is provided by the application software. Most of the 'vulnerability' in systems today comes from poorly designed or detailed application software that fails to provide 'access control', 'non-repudiation', 'version control', 'authentication & authorization' or other key components of system security. Prism and Upstream are two continuing NSA projects to collect every shred of data stored or transmitted on-line and phone calls overseas + what's 'tapped' onshore. This Massive Data Center in Utah is coming up in phases to keep it all indefinitely. The NSA provides an excellent pdf, Defense In Depth, a practical guide to IT security. The NSA's not the only outfit snooping your Web traffic. Here's What an Eavesdropper Sees when you use an unsecured WiFi. Anybody with access to the Internet's routers or application servers is able to see and soak up your packets as they fly by. I set up my elderly sister's email on earthlink, using an entirely new and unique address and within a week she had so much spam in her inbox that it was hard to see the few emails from me and my nephews and neices and somebody hijacked her account. Insecure pop3 was the culprit here, easy for crackers to filter out packets carrying userids and passwords. Here are some links about security issues in application code: Top 25 Most Dangerous Software Errors; SANS provides 20 Critical Security Controls. CyberCiti suggests20 Linux Server Hardening Tips. 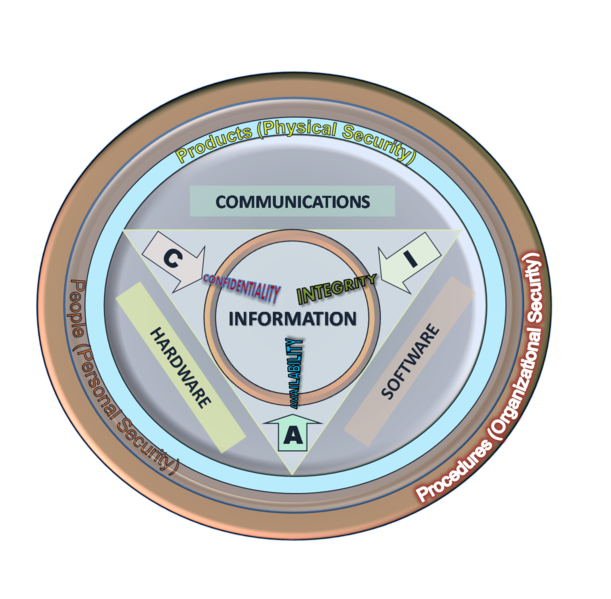 The Pillars of Information Security: The old triad of 'CIA', Confidentiality, Integrity, and Availability was sufficient to secure enterprise information way back before the _customers_ and _suppliers_ had access to the system's domain, employees were the only persons to touch a system, and most transactions originated on paper documents. Nowadays, with on-line systems handling all aspects of business transactions for customers and suppliers, and most transactions originate in the system, pillars for 'Authenticity' and 'Non-repudiation' have been added to the information security framework. Authentication - The person logged into the system is who they claim to be, key to Confidentiality and Non-repudiation. Access Control involving strong schemes for authenticating users' identities and encryption of data is an essential element of information security. Access control with robust & hidden userid and password known only to the user is 'something you know', is most often used and is enough for many situations. This can be 'tightened' by having the authentication process generate and send another code to another device, maybe a pager or text to a phone. 'Something you have' might be a smartcard or mag stripe or some other 'token'. 'Something you are' could be a fingerprint, palmprint, iris scan, face to recognize -- is expensive to get it right. A really robust scheme can use all the above. Google 'cencon lock' for another twist on this. Here's a CIO article where PayPal Says it's Time to Ditch Passwords. AAA - Triple A - Authentication, Authorization, & Accounting is another way of describing access control. It is one of the seven, or thereabouts, basic functions of a modern multi-user operating system. Most of our operating systems these days are multi-user, even if they're mostly used by one user. Apps for our personal devices running on Windows, OS-X, Unices, Android, iOS can all take advantage of their environment's AAA features to support the Confidentiality piece of the Five Pointed Star: CIAAN. Authentication may be simple with a user id and password or more complex involving multi-factors. Authorization is usually associated with users' accounts or the location of an access point, it's what the user is authorized to do on the system. Microsoft's Active Directory handles Authorization with a system of Memberships and Roles, UNIX handles it with Groups, starting directory, and startup script. Accounting may be a complete audit trail of every keystroke in some application environments. Most operating systems log every command and app that's accessed by the logged in user. Protection is essential and must be pro-active and on-going to provide security for networked resources. A common formula for protection is: Protection = Prevention + (Detection + Response). B2B networking uses the EDI-Electronic Data Interchange protocols ANSI X12 and United Nations EDIFact to exchange all kinds of business documents for supply chain management, shipping by ocean, air, or motor, service delivery, and almost any facet of business or enterprise. Purchase orders, acknowledgements, shipping notices, manifests, bills of lading, insurances, claims, health, medical and every other kind of business document have all been built into the ANSI X12 standards. EDI continues to increase in use and importance since it emerged in the late 1970s. Originally EDI documents were transmitted on costly private networks, well into the '90s, adding a dollar or two to the cost of every transaction. These days, most X12 EDI documents are transmitted directly 'server-to-server' over The Internet, at a negligible cost. The Internet's HTTP with PKI-Public Key Infrastructure SSL-Secure Socket Layer are used to verify the identity of the parties involved in the transactions and encrypt them. On private networks, transferring EDI documents adding about a dollar to the cost-per-transaction. Over The Internet, these critical transactions are practically free! At the outset of an EDI relationship the trading partners exchange their PKI/SSL key files, and have procedures in place to keep them updated and secure. Since the keys are tied to each domain it is very difficult to 'spoof' the system. If anything is out of place, the SSL will not not allow the data to flow, similar to the way your browser warns you when a site's SSL Certificate has expired. For decades since the '70s 'trade associations' picked documents from ANSI's ASC X12 Standards for their members to use. More recently, X12 has been adopted for more 'open' use as OBI-Open Buying on the Internet, which is helping to reduce the expense of a 'Tower of Babel effect' as sellers and buyers were making up their own transactions. HIPAA also uses X12 EDI for exchange of health and medical records. Proximate - A cracker using Wifi at close range can quickly defeat encryption protocol. Or they may install a device on a wired ethernet to probe and crack into systems, or gain physical access to the system console and compromise it. Supply Chain - Compromise of hardware or software that is installed into the network, the stuff of spy novels reflects reality, a disk drive that has spyware in addition to SMART, or maybe a firewall with a 'back door' that can be opened at will. 'Firmware' is relatively easy to 'flash', may be corrupted in the supply chain, and it's incumbent on network managers to audit their firmware for signs of corruption. A Pwn Plug looks like the 'power monitor' some cracker in an electrician's suit claims it to be. The advent of cheap, powerful, 'single board' computers like Raspberry Pi makes the production and deployment of these devices very affordable. Something like FXI Cotton Candy , an entire computer on a USB, is even less obtrusive. ICS-Industrial Control Systems, PLCs-Programmable Logic Controllers, SCADA-Supervisory Control & Data Acquisition: Security gets the spotlite in New Era of Warfare. Do you reckon we have any vulnerabilities in SCADA networks? SCADA protocols are used by ICS-Industrial Control Systems to control dams, HVAC, electrical plants, industrial processes and other potentially lethal higher- and lower-level technologies. PLCs are standardized components of these systems, which is great for reducing the costs involved in ICS, but they also make it easier for crackers to gain control. In the early '90s (I know for a fact) that anybody with an Atari and the phone # for the modem controlling the Lake Merriweather Dam spillway in Rockbridge County, VA could dial in and turn the Maury River into a class 6 rapid at an unscheduled time. We can all hope this got secured before the end of the '90s. There are hundreds of dams and barrages in the USA controlled using SCADA and PLCs. One in New York, the Bowman Avenue Dam, was compromised in 2013, was a wakeup call. Our 'smart grid' used to distribute electricity over large areas also uses SCADA standards, and it requires extreme vigilance and security. A compromise could damage huge components that cost hundreds of thousands of dollars and may take months to replace. In 2011, the malware Stuxnet did surveillance of Iran's nuke plants and destroyed a lot of centrifuges operated with SCADA & PLCs. Information Security, has evolved as access to enterprise systems has moved from punched cards loaded into a hopper & greenbar reports to input at the point-of-transaction via WiFi and The Internet, and real-time reports via web-browsers or smartphones. Of course, there is lots of value into knowing how to wield malware and hack into systems and tap the dark web. But there is more value in knowing how to apply best practices against threats as it is learning to threaten others. The wiki on Network Security is a good place to start learning about diligence in surveying and securing networks from home through enterprise. Carnegie Mellon's CERT-Computer Emergency Response Team has this article on Internet Security that discusses types of security incidents, vulnerabiliities of The Internet, and the policy and technology to mitigate the risks. If you're not going to secure it, don't collect it or keep it on a computer, write it down! Security can't be an add-on, it must be integral in an organization's culture from the top down, and pervasive in the organization's assets from locks on the doors thru its networks' firewalls, computing hardware, operating systems, and application software. Security needs to considered very early in the selection or development of application software and every day that it operates. Richard Clarke, presidential security advisor several years back, said: "If a company pays more for coffee than network security they _deserve_ to be hacked!". CERT's GES - Governing for Enterprise Security states clearly that today's Board Members and C-level executives might not know about the details of their Information Systems' security, but their diligence includes ensuring all aspects of the enterprise are secure. Every attourney involved in a lawsuit or criminal action against an enterprise accused of losing customer data or other valuable business data will be citing the following standards as they sue for damages and punishment. COBIT - Control Objectives for IT (.ppt) COBIT is not a detailed set of instructions or a 'how to', it is an application of Quality Management to control of IT. Organizations that practice COBIT mature quickly and have very secure systems and accurate accounting. The ITIL - IT Infrastructure Library is Quality Management applied to IT Management-- These UK-developed recommendations are freely available and represent today's best practices for IT management. ITIL is another application of Quality Management to IT, is not a detailed set of instructions about ensuring security or availability. It might be helpful to consider COBIT as strategic stuff and ITIL tactical. For detailed 'how tos', look to the study guides for technical certificates like CompTIA's 'general' Network+ or Security+, or 'technology specific' certs like Linux+ or Microsoft's MSCE and other product-specific certificates. The RedHat series of certificates was the top requested in 2012, followed by Cisco's CCNA and other product-specific certs. SOX - Sarbanes - Oxley is different from other IT standards in that it carries the Force of Law. It was passed to prevent and to prosecute corporate malfeasance. It involves standards of practice for IT and Accounting professionals. Similar laws have been written by dozens of other governments in the past few years following an exodus of crooks from the USA to other countries who didn't enforce such standards. Among other things for C-level executives, SOX says to the CIO: Secure your systems and manage them according to standards like COBIT or ITIL; Ensure all facets of security and non-repudiation; Use the systems to capture _every_ transaction of value as close to real-time as practical; Practice transaction logging, regularly verify the logs, and always provide a clear audit trail from any reported figure back to the point of transaction; Reconcile the system regularly with every external account: cash, brokerage, and other accounts or holdings; Use the system to report financial data to stockholders and the IRS; Don't cook the books. EDI - Electronic Data Interchange Standards for B2B exchange -- standard ANSI X12 and UN EDIFact documents facilitate and greatly reduce the cost of supply chain management and exchange of all kinds of documents for business, shipping, and health care today. Start now on a career as an IT Security Professional. An IS degree can lead along a career path as an IT Security Professional. All IT Pros must be security-conscious, need to be able to recognize and call out this or that vulnerability and get it out of their employers' or customers' systems. Here's is CA's Survival Guide for IT Pros, outlines issues of business continuity and disaster avoidance & recovery when disaster strikes. Dry stuff like the policy and procedures for Change Management, aka configuration management, is good to consider as you set to the other courses of our technical core. Diligence of the Configuration Manager mitigates the risk of making that change, even a 'small change', that destroys enterprise data. PCI Compliance is required of any organization that processes their customers' credit card data. Banks manage the connection between a merchant's bank account and one of the few credit card ACH-Automated Clearing Houses that instantly authorize or deline a customer's card. An organization that has this type of credit card service is subject to audits for compliance and severe penalties for breaches. Here's a very practical Check List put up by the Better Business Bureau for compliance with PCI-Payment Card Industry standards for security. The Winter of 2012 has some legislators campaigning to put the force of Law behind IT Security where organizations are custodians of Credit Card #s and other personal data. A complete survey of an application environment needs to explain how each of the checklisted items is met. PCIComplianceGuide.org has good references about the many issues of compliance -- they list lots of analysts and services for securing networks and servers handling and storing CC and other private data. The cost of complying with PCI standards must be considered in any application environment that handles credit card data -- makes PayPal rates look reasonable. HIPAA-Health Insurance Portability and Accountability Act drove down the costs of submitting insurance claims and other medical documents and drives up fears our privacy may be vulnerable. Through the '80s a physician's computer systems might have to produce a dozen or more forms via EDI since each insurance company had their own set of EDI forms. It could cost thousands of dollars of time to adapt a medical practices's systems to submit claims to a new insurance plan. It was a Tower of Bable, expensive and ran on 'real private networks' that charged a fee for every record. For every minute of patient contact there was typically another minute or two of an insurance specialist to prepare the claim(s) for the patient's insurance carrier(s). HIPAA replaced this mess of different protocols with ANSI X12 documents for all aspects of health and medical care. The instructor and a business partner worked on 'medical accounting' for years, but the last work we did in the field was to convert systems to HIPAA/X12. HIPAA applied EDI standards for modern times, where X12 health, medical, and insurance documents are routinely exchanged via The Internet. HIPAA includes guidelines for Administrative, Physical, and Technical Safeguards on systems that contain health data. The wiki also lists and describes the key documents exchanged among healthcare providers and insurance companies. HIPAA adopted ANSI X12 documents which have been used in B2B EDI since the 1970s. X12 was developed through the '90s to handle all aspects of eCommerce from cataloging, bidding, and purchasing thru shipping by ocean, air, train, or truck and distribution within large enterprises. In the late '90s HIPAA adopted ANSI X12 EDI technology, working with DISA-Data Interchange Standards Association to forge standards HIPAA adopted in 2003. This has resulted in _huge_ savings in medical accounting, insurance claims submissions, and warehousing of all kinds of patient and medical data.